Improved blood circulation affects everything in the body. 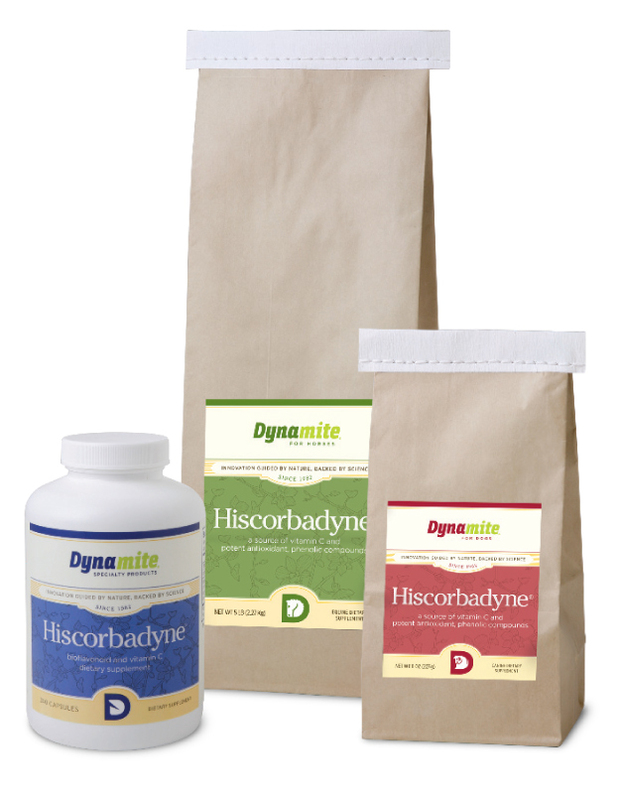 Incorporating Hiscorbadyne into any animal’s daily supplementation regimen (even your own) is of utmost importance. Hiscorbadyne’s origin can be found on the horse track. For those familiar with performance race horses, the term “bleeding out” is probably one you are all too familiar with. This is a condition that occurs when small capillaries burst in a horse’s lungs when working hard and they bleed from the nose and mouth. When Dynamite’s founder, Jim Zamzow, saw this problem he felt there had to be a nutritive solution rather than one that was purely pharmaceutical. Jim looked into new studies on the affects of oligomeric proanthocyanidins, or OPCs, on capillary strength. OPCs are natural compounds present in most fruits and vegetables, and particularly in plant bark, skin, and seeds. Through studies, Jim learned that OPCs were shown to protect against cardiovascular and other degenerative diseases and to increase the strength and elasticity of blood vessels. OPCs were shown to have numerous other benefits including reducing platelet aggregation (sticking together of cells), helping collagen repair itself and reducing inflammation. Given the benefits Jim discovered about OPCs and the improvement he was seeing with the racehorses on the track, his next logical step was to apply this knowledge across the board for all living creatures–including humans. The formula of Hiscorbadyne combines the power of OPCs with other plant-derived, body-ready, antioxidants or bioflavonoids with Ester-C®*– a stomach-friendly, bioavailable form of Vitamin C. These antioxidants work to provide immune system support, promote circulation, and increase capillary strength–all important for maintaining health in all species. Hiscorbadyne is available as a powder in an equine formula (5 lb) and canine formula (8 oz), and as an encapsulated human formula (240 count). Equine Benefits – Click Here to Order EQUINE Hiscorbadyne! • Excellent nutritional support for respiratory conditions and overall respiratory system health. • Hiscorbadyne is also found in Dynamite’s equine product Super Stress. Super Stress is recommended for horses under the extreme stress of competition, illness or injury recovery. Canine Benefits – Click Here to Order CANINE Hiscorbadyne! Many people argue that Hiscorbadyne is not necessary for dogs because dogs, unlike other species, are able to manufacture enough vitamin C to sustain life. We follow the belief that vitamin C is “conditionally essential”—a nutrient needed in high amounts during certain stages of life or conditions of health. • Young animals can benefit tremendously from antioxidants if they are vaccinated frequently and their immune systems are still not yet fully developed. • Antioxidants can help maintain optimum health in your animal’s gastrointestinal and cardiovascular systems, liver, kidneys, eyes and immune system. • Hiscorbadyne improves immune-cell function for dogs (and cats) in their senior years. • Antioxidants become even more important as dogs age in the fight against free radicals and their associated damage to cells in joints and other tissue. • Supplemental vitamin C is beneficial in dogs in times of stress which can include travel, boarding, heavy exercise, pre- and post-surgery, illness, certain degenerative conditions and aging. Human Benefits- Click Here to Order HUMAN Hiscorbadyne! • Antioxidants are free radical scavengers and are vital for immune system health. • Humans are not getting the necessary vitamin C from their food because this precious water-soluble vitamin is easily destroyed when food is stored, processed, or cooked. The FDA recommends 60 mg a day which is the amount necessary to prevent severe scurvy rather than amount necessary for abundant health. • Bioflavonoids act as natural anti-bacterial promoting circulation, stimulating bile, and lowering cholesterol while increasing the efficacy of vitamin C.
• Vitamin C is a natural anti-inflammatory and is beneficial for joint pain and injuries. • OPCs work with vitamin C to bind collagen to cellular tissue, thus making the tissue more flexible (i.e. anti-aging). • Stress and pollutants take a toll on our immune systems. Hiscorbadyne’s formula is a nutritive immune system booster. • Increased circulation helps with varicose veins, bruising, phlebitis prevention and blood clot prevention. • According to Pycnogenol, the Miracle Antioxidant, by Rita Elkins, M.H., Pycnogenol (found in Pine bark and grape seeds) is an excellent supplement for any type of allergy because it decreases the production of histamines. *Ester-C® is a registered trademark of the Ester C Company. These statements have not been evaluated by the FDA and are not intended to diagnose, treat, cure, prevent or mitigate any disease. Dynamite Specialty Products takes a firm stance that our products always be used in accordance with the opinions and expertise of your trusted health care professional, doctor and/or veterinarian. Hi Rinda! Feel free to email customer service at info@dynamitemarketing.com and they can help you. How does this product work for sheep?